Auctions take place in real time as the user's web page is loading. As a result, a user sees the banner of the advertiser who bid the highest for a set of 1000 impressions (CPM). The first stage is an internal auction: only display lines participate in it. Then the Yandex display-advertising system selects the line with the highest bid for the second stage. The second stage is an RTB auction. Ad systems that represent the advertiser can participate in it: the Yandex display-advertising system, Yandex.Direct, and third-party DSPs (Demand Side Platforms). 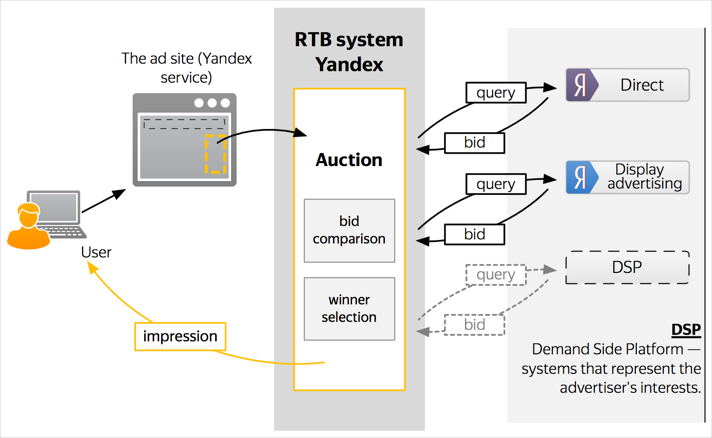 The Yandex RTB system compares bids and determines who the winner is.